B&L Cleaning Services provides jet washing, pressure jet washing and support services throughout Widnes, Cheshire and across the whole of the North West of England. The jet washing services we provide are tailored to each of our client's requirements and are further modified to match the individual nature of each commercial application and need. The Jet washing services range from the removal of graffiti in public places such as buildings, walls and bus shelters to high pressure jet washing and cleaning of public monuments and statues. Our jet cleaning services can be put to almost any use including cleaning of paths, driveways and paved areas to cleaning walls and roofs of moss, lichens and the general built up grime. 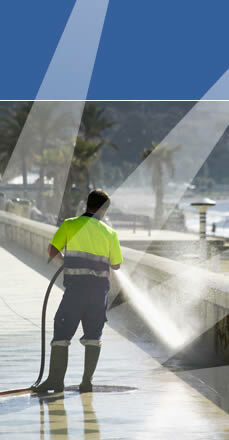 The size of our jet washing contracts vary from one off small cleans to remove specific pieces of graffiti to long term contacted services to supply a complete jet washing service to an industrial estate or shopping precinct. Whatever your jet washing needs, we have the perfect team to ensure we provide you with the highest jet washing standards in the area. With over 25 years jet washing experience at B&L and a work force of over 320 employees, we have perfected our services and use only the best equipment which ensures all our customers get the best jet washing service available. If you want a better jet washing service and to reduce your current jet washing costs, give us a call today on 0151 257 9091 and we will be happy to help you.